Are you looking to reschedule your Microsoft Dynamics 365 upgrade but are not sure where to start? Or perhaps you have been contacted by Microsoft about an update to your Dynamics 365 instance and are not sure what to do. Read on, we can help! If you have been emailed from Microsoft confirming they will be upgrading the site the first thing is to never ignore it. We have seen sites where the customer has left the message and the site has been upgraded and the following day you can’t get into the system – this is rare but a risk. We don’t want this to happen and it shouldn’t ever need to do that. By controlling the updates you will be able to have seamless upgrades and your Dynamics 365 site will run like clockwork. Step one to manage your upgrade is to schedule your sandbox site first. It is really important to ensure that your sandbox is an exact copy of ‘live’ and then put a date in with Microsoft to upgrade that. Once the Dynamics 365 sandbox has been upgraded you will need to dedicate time to ensure that the functionality works and that it is looking and working correctly. This may take some time and often getting a couple of users to test the way they use Dynamics 365 is a great way to ensure it will work when the live site is updated. You may come across bugs, have questions or have issues where the update has altered some of the functionality. If that happens you may need to work with a partner to understand what the issues are. The partner can then put together a fix ready for deploying when the live site is upgraded. If you don’t have a partner and are looking for help, please contact us. Once you are happy with your sandbox testing and are satisfied you have as many issues minimized as possible your live site can be scheduled in. Ensure you choose the right site you wish to schedule and then on the right-hand side click “reschedule update”. Choose your preferred and alternative date and time for an update and click “approve update”. The status will confirm if your update was approved but ensure you receive this. 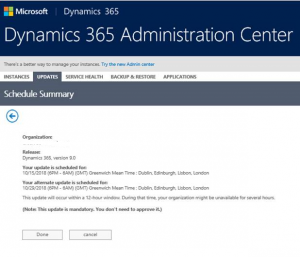 What do I do if my Microsoft Dynamics 365 site isn’t updated? We don’t see this often but again it can happen. No. 1 get in touch with Microsoft via the portal or your Dynamics 365 partner if you have one. By managing it through you will ensure that you are getting a controlled update which is immensely important. What do I need to consider for an upgrade? As well as ensuring your sandbox is upgraded first and end users test it thoroughly you will need to check your plugins, anything you do periodically that may not come into end-user testing and also consider things like the Outlook client on the day of the upgrade. Already a user of Dynamics 365? For more hints and tips on how to get the best out of Dynamics 365 check in regularly there are lots of useful articles in our blog pages or popular resources page. Need Dynamics 365 support? Caltech can help. We work with on-premise and Online environments. Contact us and we will offer competitive pricing! We could also help save you money by undertaking a site review, licensing and storage review.